The telecom service provider investment (CAPEX) analysis report provides detailed information about CAPEX spending of telecom service providers on various telecom equipment they buy from OEM’s and Engineering, Procurement and Construction (EPC) companies. Telecom service providers are looking to invest in various software platforms and hardware that will enable them to operate in the digitized ecosystem and help them to optimize their network and enhance the customer experience. The rise of the fifth generation of cellular technology is expected to drive telecom service providers’ CAPEX in the coming years. 5G technology is currently in the testing phase and is expected to be launched fully in the next few years. Telecom service providers are setting aside significant amounts of capital in order to accelerate network deployment and increase their network capacity.Moreover, rapid development in terms of research activities with respect to innovative telecom equipment and services by equipment manufacturers is allowing telecom service providers to deploy or launch their 5G services as per their intended schedule. Rise in demand for 5G connectivity has led to a rise in investment from telecom service providers in every zone. 5G connectivity is likely to enhance network performance tenfold as compared to the current level in terms of network throughput, latency, reliability, etc. To achieve this, telecom operators will have to proactively invest in 5G infrastructure. The spending would be mainly for new spectrum, RAN infrastructure, and transmission networks. However, this new approach of network and asset sharing is one of the factors that is leading to low capital investment of Telecom Service Providers (TSPs). Capital expenditure spending of telecom service providers is bifurcated on the basis of vendor type, equipment type, services, and network type. Vendor type segment is further bifurcated into OEM’s and Telcos/EPC’s. Based on vendor type, telecom operators are expected to spend more on OEM’s. This is due to the increasing number of partnership deals between them to support the smart city initiatives undertaken by governments. Equipment covered in the study are telecom hardware, and IT or non-telecom hardware. Telecom hardware includes aggregation equipment, wireless infrastructure, IP routers and CES, optical equipment, TDM voice infrastructure, and other telecom/datacom network equipment. IT or non-telecom hardware includes batteries, control hardware, etc. On the basis of services, telecom service provider CAPEX spending is bifurcated into EPC and others. Others segment is further dividedinto consulting, network design and engineering, installation & maintenance, and testing & optimization. On the basis of network type, the spending is bifurcated into wired and wireless. Telecom operator CAPEX spending is majorly seen in wired network connectivity services. This is due to the fact that operators are trying to mark their presence in untapped markets and expand their network coverage. This expansion of network capacity and coverage will require operators to increase their investment in the equipment and services required for the same. In terms of region, the study has been divided into North America, Europe, Asia Pacific, Middle East & Africa, and South America.The market in Asia Pacific is expected to account for a larger share during the forecast period. This is attributed to the many untapped markets in this region. Moreover, along with large population, demand for connectivity services is also significantly growing, thus providing an opportunity for telecom operators to enhance their revenue streams. More number of carriers in Asia Pacific is also one of the reasons for Asia Pacific to have a larger share in telecom operator spending. Telecomservice provider (CAPEX) analysis study include CAPEX spending of China Mobile Ltd.,Verizon Communications, Inc., AT&T, Inc., Vodafone Group Plc., Nippon Telegraph & Telephone Corporation, Telefonica S.A., America Movil, China Telecom, SoftBank, Deutsche Telekom and other TSP’s.Furthermore we have also analyzed various OEM’s and EPC’s. Some of the leading OEM’s included in the company profile section includes Cisco Systems, Inc., Nokia Corporation, Huawei Technologies Co., Ltd., ZTE Corporation, and others. 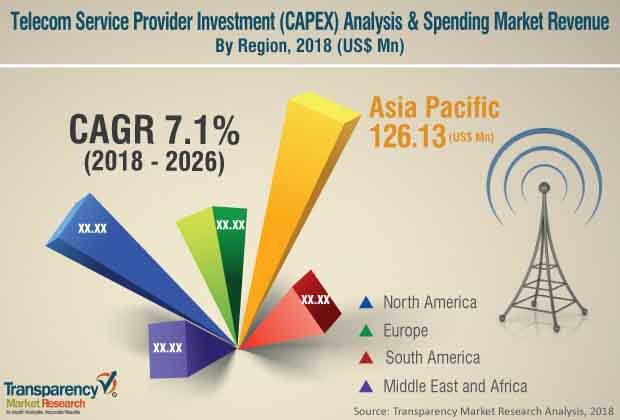 This comprehensive report by Transparency Market Research analyzes and forecasts the telecom service provider investment CAPEX spending at the global and regional level. The report provides analysis of the global telecom service provider CAPEX spending for the period from 2016 to 2026, wherein 2018 to 2026 is the forecast period and 2017 is the base year. Data for 2016 is provided as historical information. The report covers all the major trends in the telecommunication industry that play a major role in the growth of CAPEX spending of telecom service providers (TSP’s) over the forecast period. It also highlights various drivers, restraints, and opportunities expected to influence growth in CAPEX spending during this period. The study provides a complete perspective on the capital expenditures of telecom service providers in terms of value in US$ Bn, across different geographical regions namely North America, Europe, Asia Pacific, Middle East & Africa, and South America. The report would help suppliers and distributors to understand the current and future trends in the telecommunication industry and formulate their strategies accordingly. The overview section of the report showcases the industry dynamics and trends such as the drivers, restraints, and opportunities that influence the current nature and future status of this study. The report also provides the ecosystem analysis for the telecommunication industry in order to understand how telecom service providers procure the telecom equipment and services from OEM’s and Engineering, Procurement and Construction (EPC) companies. These capital expenditure estimates have been analyzed by taking into account the impact of different political, social, economic, technological, and legal factors along with the current market dynamics affecting the CAPEX spending growth. Capital expenditure spending of telecom service providers is bifurcated on the basis of vendor type, equipment type, services, and network type. Vendor type segment has been further segmented into OEM’s and Telcos/EPC’s. In terms of vendor type, telecom operators are expected to spend more on OEM’s. This is due to the increasing number of partnership deals between them to support the smart city initiatives undertaken by governments. Equipment covered in the study are telecom hardware, and IT or non-telecom hardware. Telecom hardware includes aggregation equipment, wireless infrastructure, IP routers and CES, optical equipment, TDM voice infrastructure, and other telecom/datacom network equipment. IT or non-telecom hardware include batteries, control hardware, etc. On the basis of services, telecom service provider CAPEX spending has been bifurcated into EPC and others. Others segment is further segmented into consulting, network design and engineering, installation & maintenance, and testing & optimization. In terms of network type, the spending is bifurcated into wired and wireless. The report also includes competitive profiling of telecom service providers, OEM’s, and EPC’s around the globe. The telecom service provider investment (CAPEX) analysis data estimates are the result of our in-depth secondary research, primary interviews, and in-house expert panel reviews. In order to compile the research report, we conducted in-depth interviews and discussions with a wide range of key industry participants and opinion leaders. Primary research represents the bulk of our research efforts, supplemented by extensive secondary research. Primary research involves telephonic interviews, e-mail interactions, and face-to-face interviews for detailed and unbiased reviews about the study, across geographies. Primary interviews are usually conducted on an ongoing basis with industry experts and participants in order to get latest insights and validate the existing data and analysis. Primary interviews offer new and fresh information on important factors such as industry trends, CAPEX spending, growth trends, etc. These factors help to validate and strengthen secondary research findings. Moreover, the data collected and analyzed from secondary and primary research is again discussed and examined by our expert panel. We reviewed key players’ product literature, annual reports, press releases, and relevant documents for competitive analysis and market understanding purposes. Secondary research also includes a study of recent trade journals, technical writing, internet sources, and statistical data from government websites, trade associations, and agencies. This has proven to be the most reliable, effective, and successful approach for obtaining precise market data, capturing industry participants’ insights, and recognizing business opportunities. Telecom companies are focusing on achieving long-term growth through effective integration and continuous improvement and innovation in telecommunication service offerings. Increasing demand for telecommunication services from micro, small, and medium enterprises (MSMEs) and large enterprises provides growth opportunities for telecommunication service providers to increase their revenue. To grab this opportunity, telecom operators therefore would have to set aside significant investment for the purchase of equipment, license, etc. to provide connectivity services of these companies. The telecom service provider (CAPEX) analysis study includes CAPEX spending of China Mobile Ltd., Verizon Communications, Inc., AT&T, Inc., Vodafone Group Plc., Nippon Telegraph & Telephone Corporation, Telefonica S.A., America Movil, China Telecom, SoftBank, Deutsche Telekom, and other TSP’s. Furthermore, we have also analyzed various OEM’s and EPC’s. Some of the leading OEM’s included in the company profile section include Cisco Systems, Inc., Nokia Corporation, Huawei Technologies Co., Ltd., and ZTE Corporation.